The most tender bites of well seasoned chicken stirred in with curly al dente pasta, tomatoes, olive oil, garlic and fresh basil. A fresh and bright summer pasta dish that takes minutes to make in your electric pressure cooker. Season and brown the chicken. Turn your Instant Pot to the saute function. As the pot heats up pound your chicken breasts to 1 inch thick. I did this by rolling them out/smashed them down with a rolling pin. Place the chicken breasts on a plate. Season one side of each of the chicken breasts with 1 tsp of Italian seasoning, 1/4 tsp of salt and 1/4 tsp of pepper. When the display says HOT add in 1 Tbsp of olive oil. Then place the seasoned side of each of the chicken breasts down into the bottom of the Instant Pot. Let the chicken brown for 5 minutes without disturbing it. Season the other side of each of the chicken breasts with 1 tsp of Italian seasoning, 1/4 tsp of salt and 1/4 tsp of pepper. Then use tongs to flip the chicken over to the other side. Let them brown for 5 minutes. Remove the chicken and place on a plate. Deglaze. Use the 3 1/2 cups of chicken broth to deglaze the pot. Stir in the pasta. Then place the chicken breasts on top of the pasta. Pressure cook. Cover the pot and secure the lid. Make sure valve is set to “sealing.” Set the pressure cook button/manual button to 4 minutes on high pressure. Once the 4 minutes is up let the pot sit there for 5 minutes. Then move the valve to venting. Prepare bruschetta. While the food is pressure cooking dice up the roma tomatoes into small pieces. Place them in a bowl. Add in the garlic, basil, 1/4 cup olive oil, 1/4 tsp salt and 1/4 tsp pepper. Stir together. Toss together. Remove the chicken breasts and slice them into pieces. Add the chicken back into the pot. Toss the tomato mixture into the pot. Then stir in the parmesan cheese. Scoop onto serving plates and sprinkle with additional parmesan and basil, if desired. 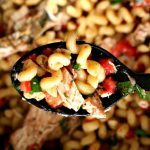 Recipe inspired by Best Bruschetta Chicken Pasta on Delish.